Buffalo Springfield was an American supergroup that didn’t exist long enough to be recognized as such. Though the band’s tenure was short, Buffalo Springfield was a pivotal rock group with an organic, home-grown musical approach that reverberated beyond the Sixties. Along with the Byrds, Buffalo Springfield laid the groundwork for the folk-rock and country-rock genres that took root in the Seventies. They produced two of rock’s greatest guitarists in Neil Young and Stephen Stills. Their three albums – Buffalo Springfield, Buffalo Springfield Again and Last Time Around – wove together strands of folk, country, pop, soul and rock. Buffalo Springfield also recorded one of rock’s greatest topical songs, “For What It’s Worth.” A cautionary number inspired by clashes between police and youthful protesters on Los Angeles’ Sunset Strip, it was the only Buffalo Springfield single to make the Top 40, reaching Number Seven in 1967. Later in 1967, Buffalo Springfield had some more regional success with two songs written by Stills, “Bluebird” and “Rock ‘n’ Roll Woman.” The group boasted an almost uncontainable pool of talent. Stills, Young and Furay were all formidable writers, guitarists and vocalists. However, they were also very strong-willed individuals. When bassist Palmer got deported to Canada following a drug bust, producer Jim Messina – himself a singer and guitarist with a predilection for country- and folk-flavored rock – joined the band. 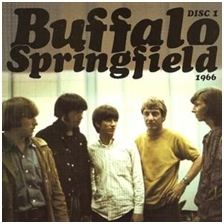 Internecine squabbles, particularly between Stills and Young, led to Buffalo Springfield’s disbanding, but not before they’d recorded three classic albums that sketched a number of directions rock would follow in their wake. It would be hard to imagine the careers of the Eagles, Jackson Browne and others without Buffalo Springfield as a precursor, and the roots of the popular Americana movement can be found here, as well. However, the prolific solo careers of Neil Young, Stephen Stills and Richie Furay, and the band members’ respective group endeavors – Crosby, Stills and Nash (and sometimes Young), Poco and Loggins and Messina – are the larger, ongoing legacy of Buffalo Springfield. Neil Young included a nostalgic song about his old band, entitled “Buffalo Springfield Again,” on his 2000 album, Silver and Gold, raising speculation that some sort of reunion might be in the offing. However, the deaths of Palmer, in 2004, and Martin, in 2009, prevented a reunion of the original lineup. But in 2010, Young, Stills and Furay got back together to play the annual Bridge School benefit concert in California. The following year, the three musicians – joined by drummer Joe Vitale and bassist Rick Rosas – played six shows in Oakland, California, followed by shows in Los Angeles and Santa Barbara. They also played the Bonnaroo Music and Arts festival in Tennessee that year. Then, in 2012, Furay said that no further reunions were planned. Storm Thorgerson il genio della Hipgnosis.